Aaron Plessinger had chills prior to the first moto. 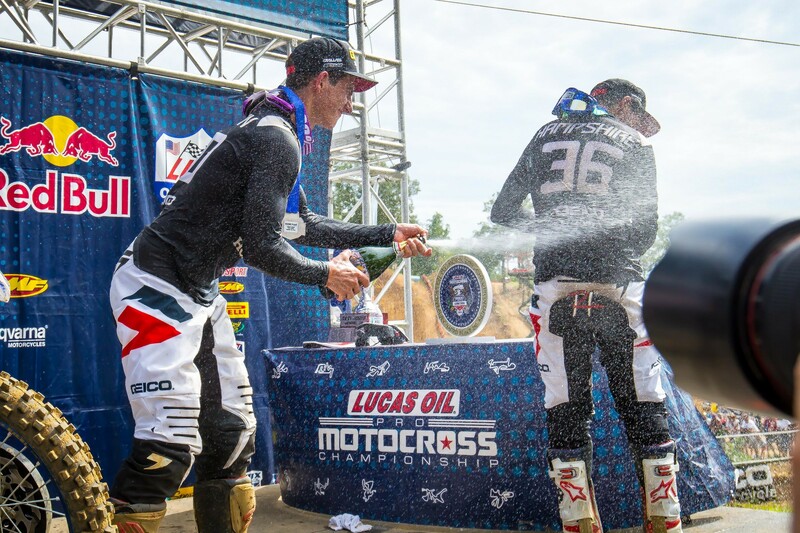 That’s the type of emotion a championship in Lucas Oil Pro Motocross can induce. Plessinger shouldn’t have had many reasons to worry. 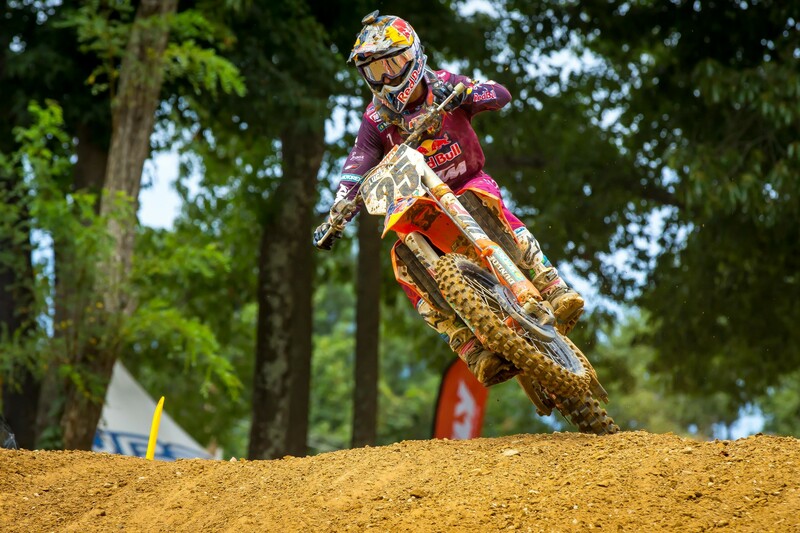 He did enter Budds Creek, round 11 of the championship, 78 points clear of Alex Martin after all. And only 50 points would be available after the weekend. But seeing a title all the way to the finish is no easy matter for anyone. Rather less a rider who just a few weeks ago was celebrating the birth of his first child. 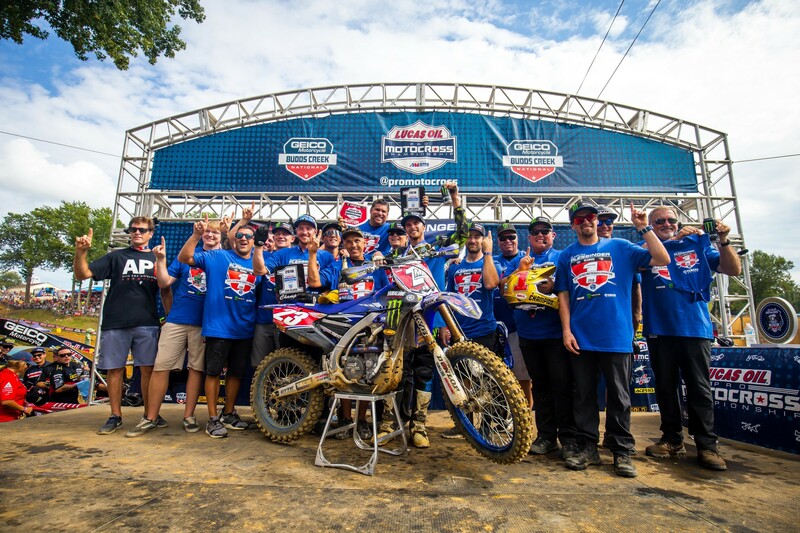 Plessinger’s title is the fourth for a Star Racing program that not so long ago would have never been on the radar for most amateurs. The new Yamaha certainly helped. And so did the signings of Jeremy Martin and Cooper Webb from the amateur ranks. (Martin won two 250 Pro Motocross championships for the team, Webb one.) Even with Martin and Webb on the team, they were thinking of the future, plucking a tall, lanky kid from Ohio, who cut his teeth in the woods, out of the amateur ranks. While Plessinger always had the speed, putting it all together for an entire year was tough. He worked hard on his mental game this year and its paid off with two titles. “My brain is still kind of mush right now. I can’t even process it. It was exciting for sure. Then I realized I had to go back out for the second moto [laughs],” he said post-race. What’s the future hold? Well, the immediate future will be helping Eli Tomac and Justin Barcia erase a six-year losing streak for Team USA at the Motocross of Nations at RedBud in October. After that? Maybe a move to the 450 Class full-time. Maybe another year in the 250 Class. Those are questions for the future, though. The present is celebrating a title. What a strange day in the 450 Class. Eli Tomac was “off”—by his standards anyway—until he wasn’t. Ken Roczen came into the weekend dealing with an illness and wasn’t expecting great results. Yet, he won a moto and was thisclose to an overall. Marvin Musquin was “lucky” to be here, he said post-race. He suffered a crash earlier in the week and was riding hurt. Throw in a classic El Chupacabra moment from Blake Baggett and you had all the mixings for a great day. We should come to expect these rides from Eli Tomac by now. Too many times this year we’ve seen some all-time come-from-behind rides from the championship leader that leave you scratching your head asking, “How did he just do that?” We witnessed another one today. After a terrible start in the first moto and third place finish, Tomac was once again buried off the start of moto two. Throughout the early portion of the moto, Tomac seemed to be struggling to find a rhythm. He sat behind Blake Baggett before something finally clicked. Tomac began clicking off laps three seconds faster than leader Roczen. He blitzed around Baggett and gained another position when Justin Barcia washed the front. Then he hit the after burners and caught Musquin. It didn’t take long to catch Roczen from there. And once he got the lead it was over. Somehow, he turned a day that looked, at times, like he would lose a handful of points, into an overall win and a 20 gap heading into the season finale next weekend at Ironman. 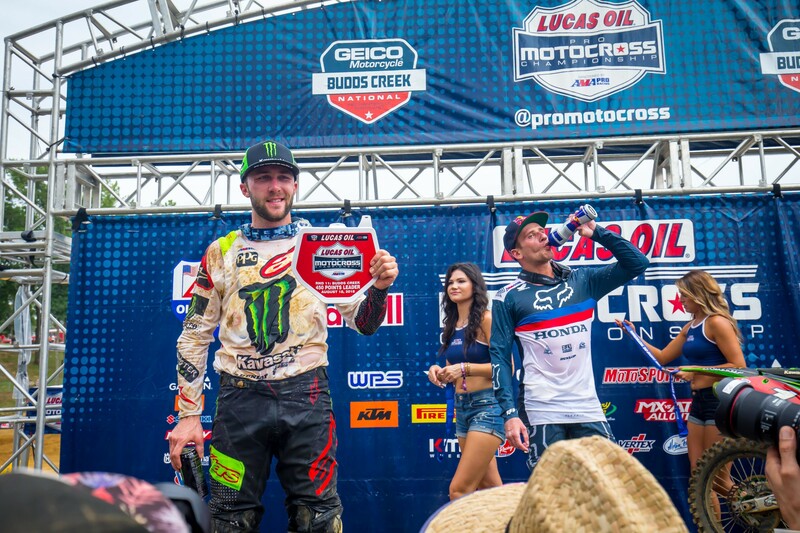 Sweltering heat greeted riders at the penultimate round of the championship at Budds Creek, just outside the nation’s capital. Temperatures were in the low 90s around race time, but it felt more like 97 degrees. The heat would take its toll on Ken Roczen in the second moto, who said he “ran out of gas” late in the race. 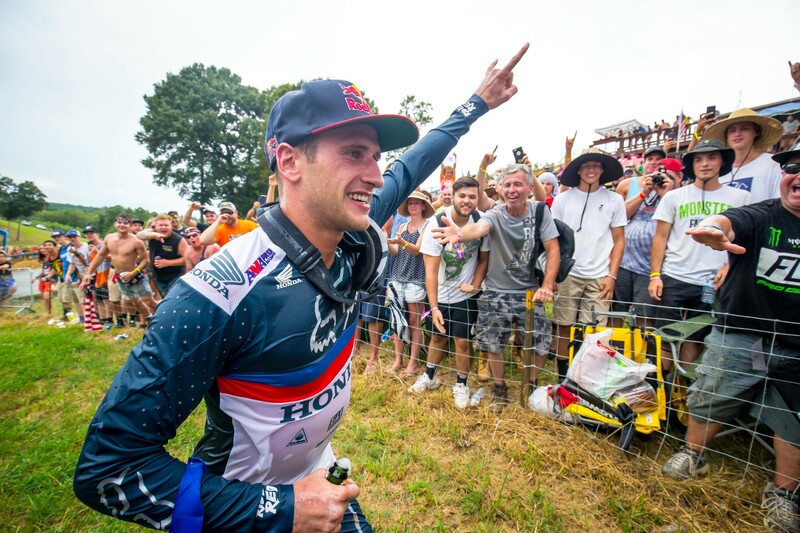 Roczen had a chance at his first overall since the Ironman finale in 2016. He chased down Musquin early in the first moto and then held off a late surge by Marvin to take the moto win. The second moto was nearly a mirror image. After starting around fifth, Roczen took charge early and built a decent lead on Musquin. Although he wasn’t stopping Tomac’s comeback, he was still in line for the overall win before Blake Baggett made a late charge to grab second. There is no doubt Musquin let a bunch of points slip through his grasp today. With Tomac dealing with bad starts both motos and Musquin starting up front, the chance was there for a big points swing. It never materialized though, as Musquin couldn’t get around Roczen in the first moto and he struggled down the stretch in the second moto. In the post-race press conference, Musquin said he had a big crash earlier this week and he was lucky to be racing. Reigning Monster Energy Supercross Champion Jason Anderson made his return to racing today. Anderson was fast in qualifying and made a late charge to take fourth in the first moto, but he did not line up for the second moto. At this time, we don’t have official word on his absence, but the team said in a post-race press release that he will race next weekend. “I had a decent weekend,” said Anderson in a statement. “I was able to qualify third and get fourth in the first moto. I didn’t want to get super winded or take too many chances for the second moto, and just wanted to ease myself into it. I’ll get back out there next weekend and will see if I can do two solid motos." Throughout this season, RJ Hampshire has shown flashes of brilliance. But every time he seemingly has it figured out, something happens. Whether it be a first turn pileup, or a crash, or someone landing on him, the former Horizon Award winner had yet to put together consecutive moto podiums this year. That changed today. The Florida native is accustomed to the heat and humidity and said the conditions didn’t bother him at all today. He chased Plessinger around the first moto and took a strong second. In the second moto, he wasted little time moving to the front. By lap four he had moved into the lead and then held off his teammate Chase Sexton to grab his first career moto win and overall. 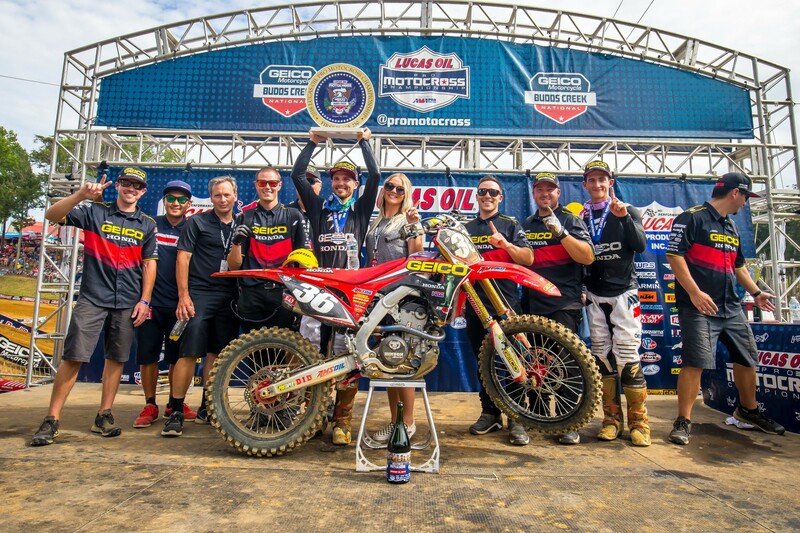 It was a banner day for the GEICO Honda team, as they went 1-2 in a race that the team title sponsor—GEICO—is the title sponsor of. Sexton had garnered just one overall podium prior to today (Tennessee) and after a seventh in the first moto, it wasn’t looking promising. Thanks to a second in moto two and a few strange scores behind him, the second-year pro grabbed second overall. Although he trains in Florida, Sexton said the conditions were tough. Another strong day—this time in dry conditions—for Mitchell Harrison, who is still seeking a ride for 2019. Following a fourth in the first moto, Harrison was in line for another overall podium as he sat third late in the second moto. But he would lose two positions on the final lap and finished fourth overall, one point behind Plessinger. “Overall it was a good day,” said Harrison in a statement. “I rode great in the motos and went 4-5. I proved to myself that I can stay up front in dry conditions. I can’t thank everyone at Rockstar Energy Husqvarna Factory Racing enough and I’m looking forward to next weekend." Justin Cooper was the fastest qualifier, but his day was undone early in the first moto when he was involved in a first turn pileup. He finished 14th in the moto. He rebounded in the second moto with a late charge to grab third and seventh overall. His teammate Dylan Ferrandis also had problems. He was down in the first turn in moto two and came back to tenth. He took ninth overall.